LONG BEACH — What do you get when two iconic ships meet each other? Port history. On March 12, the historic Queen Mary was introduced to Cunard Line’s new Queen Elizabeth. In September 1967, Queen Mary passed Cunard’s original Queen Elizabeth during her final transatlantic crossing. On that night, the lights were flashed on, the Tyfon whistles sounded and each captain tipped his hat in a farewell salute. From 1947 to 1967, Queen Mary and the original Queen Elizabeth crisscrossed the North Atlantic, many times sighting each other in mid-ocean, delighting passengers, captains and crew. 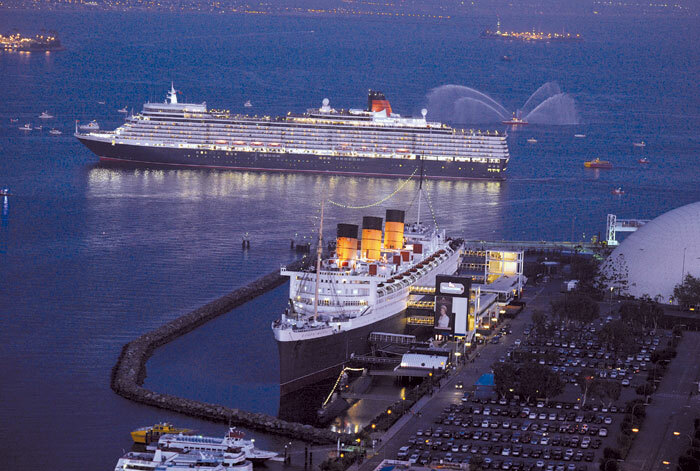 Queen Elizabeth, the newest addition to the Cunard fleet, left its mooring in San Pedro to meet the former R.M.S. Queen Mary in Long Beach Harbor, to much fanfare. As photographers snapped pictures from a media boat, Goodyear’s airship Spirit of America caught the meeting from above. The new 90,000-ton Queen Elizabeth follows in the wake of several Cunard Line vessels: Princess “met” with Queen Mary in the early 1980s; in 2006, the company’s current flagship Queen Mary 2 was there; and Queen Victoria came to call in 2011. Prior to serving as a hotel and tourist attraction, Queen Mary was considered the grandest ocean liner ever built when she embarked on her maiden voyage in May 1936.